A while back I wrote here about how a video of my late friend Rick Roderick had surfaced on the web. I was so astonished by that video — to hear his voice and brilliance after all those years. This wild man of philosophy, a Texo-Marxist genius with a hellacious drawl, was too busy being an activist to get tenure at his first job at Duke University; so he became an itinerant philosopher. And one of his gigs was teaching a series of lectures for The Teaching Company. And now more than a decade after his premature death, he has garnered quite a cult following because of those videotaped lectures now on the web and web sites and a wikipedia entry. 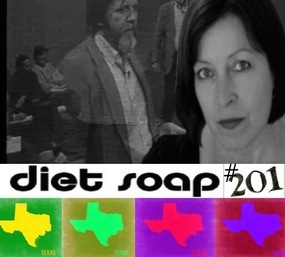 Because of my connection with Rick, the novelist Doug Lain of the Diet Soap podcast invited me to be on his show. We talked about Rick, critical theory, psychoanalysis, and my book on the political unconscious. Doug just posted the wonderfully edited podcast, with clips from Rick’s lectures, the Art of Noise, and other interesting snippets. Wonders of the digital era — someone has digitized and uploaded a twenty-year-old interview with Rick Roderick, whom I first met when he was getting his doctorate in philosophy at the University of Texas. I was an undergrad in history, but conversations with him ultimately moved me to philosophy, not for the love of Plato or Kant, but for the love of changing the world. Rick died way too young, in 2002, of too much stress and cigarettes. He always knew he was going to die young. I’m glad the digital era lets his words and voice live on in this 30-minute piece. Even with production values that were low twenty years ago, the tape is mesmerizing. Rick was a true Texo-Marxist American intellecutal, as moved by Woody Guthrie, Faulkner, and Dostoevsky as he was by Adorno, Marcuse, and Guy Debord. Click here for the video.